Schwarzman Scholars class of 2020 count among their group of remarkable individuals the writer of the winning essay that named the NASA Mars rover - Curiosity; a medical doctor who founded a science policy think tank in partnership with London City Hall and the European Commission; a documentary filmmaker; a Captain of the British Army Taekwondo team and Fangzhou Xu who graduated from UCL with a Bachelor's degree in Economics. He currently serves as China Business Development Advisor at DUBAL Holding LLC. Fangzhou is 23 years old and from Beijing, China. 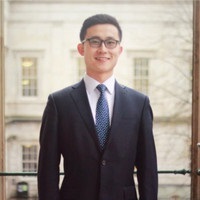 Fangzhou Xu graduated from UCL in June 2016 with his BSc in Economics. In his final year he wrote a dissertation on How to Measure the Economic Impact of UCL’s Newham Campus on the Local Region and participated in the ExploreEcon 2016 conference giving a talk about his work. During his undergraduate years he was very active as both president and chairman of the Economist’s Society. Head of department Professor Antonio Cabrales said “This distinction is a testament to the talent and hard work of our students, of which Mr. Xu is a perfect ambassador, as well as to the quality of the research-based training provided by the UCL Economics department”. Chosen for one of the most selective postgraduate programs in the world, Scholars will receive a fully funded scholarship to study at the new Schwarzman College at the prestigious Tsinghua University in Beijing. Schwarzman Scholars is designed to prepare its graduates to build stronger relationships between China and a rapidly changing world and to address the most pressing challenges of the 21st Century. Profiles of the members of the Class of 2020, who will enrol at Schwarzman College on the Tsinghua University campus in Beijing in August 2019, can be found here.